Geotrichum is a cosmopolitan fungus with a worldwide distribution that can be isolated from soil, plants, milk and milk products. Geotrichum has dry spores typically dispersed by air. Geotrichum has a rapid growth rate. Colonies are flat, powdery or waxy, and are white in color. Geotrichum has no conidiophores. 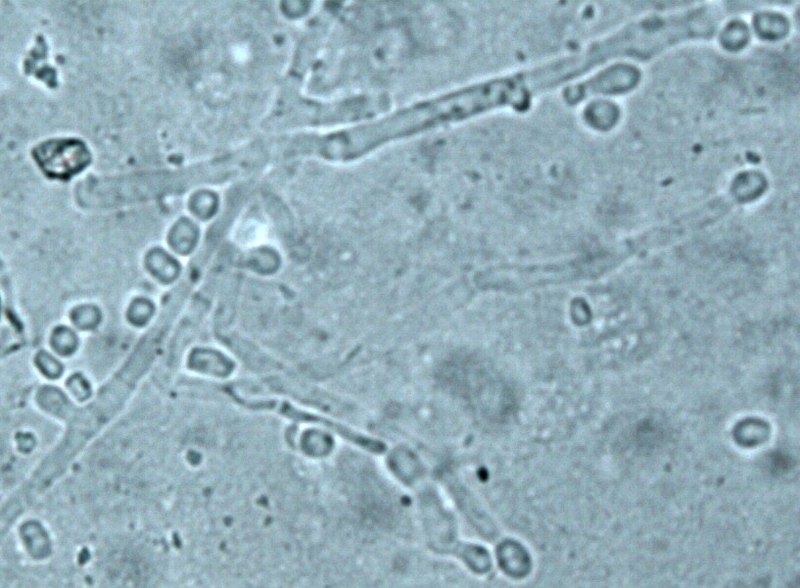 The spores are formed by the fragmentation of the hyphae (arthrospores). The spores are hyaline, unicellular, and variable in length and width. Geotrichum can cause allergic and asthmatic reactions in sensitive individuals. Geotrichum species have been reported to cause intestinal tract, bronchial and pulmonary infections. However, Geotrichum is considered a normal component of human flora.